Last summer i wrote a blog on the rising phenomenon known as the chatbot. A year on I was back at another Meet Up with the bot devs (this time in Kings Cross) to reflect on how far the technology has come. Back in June 2016 most people didn’t know what a bot was and even those that did were unsure about how they might be deployed- what would people actually use them for? Surely ordering pizza from a bot is more of an effort than just using a conventional app or even the phone! A year on bots are everywhere and even the housing sector is starting to tentatively explore the idea – so what’s changed? 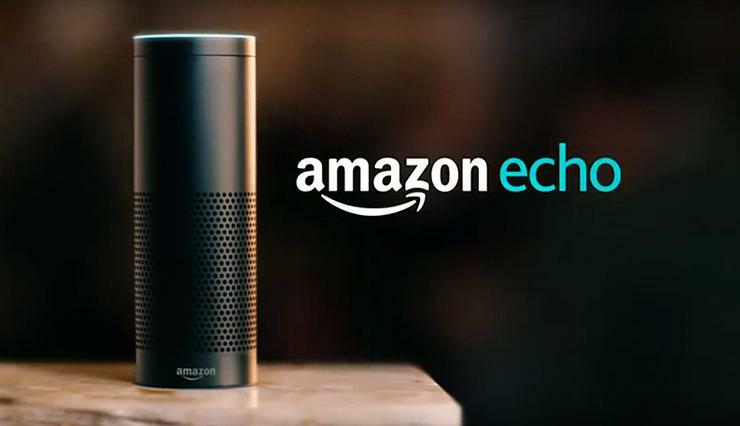 In September 2016 Amazon released the Amazon Echo in the UK, a physical device as body for Amazon’s intelligent agent, Alexa. Suddenly the benefits of a conversational interface, natural language processing and the power of an intelligent assistant become apparent. Amazon’s breakthrough product has changed consumers understanding and perception of a chat interface. The marketing and press coverage has been a big part of this shift in understanding but the raft of Alexa inspired conversation in technology circles and beyond reflects more than just got good PR. The device is genuinely exciting to use and more importantly useful. The Echo takes the essence of a chatbot – a conversational interface and simplifies it further by removing the need for a screen altogether, this new form of interaction known as a headless user interface is the next step in using natural language to retrieve data and perform tasks. The current applications for the Alexa chat bot through the Amazon Echo device are very much consumer focused- ordering things from Amazon, playing music from Spotify and controlling your Hive smart thermostat. However the platform has begun to inspire new use cases, some of them particularly relevant in housing. An area where a headless, natural language based system can really add value is in supporting older people in their homes. Technology up start Alcove are challenging traditional supported housing technology by replacing pendants and pull cords with the Amazon Echo. While the technology is still at an early stage Alcove’s Alexa Skill will allow an older person to say out loud ‘Alexa, I need help’ and the device will make contact with pre-programmed emergency contacts. Using Alexa in this context shows off just how useful natural language processing is. A user doesn’t have to learn a mobile app, navigate a TV remote or even press a single button but just use voice commands to access information or call for help. You can imagine how Alexa could make reporting a damp home, a missed rubbish collection or a broken heating system as simple as saying ‘Alexa, my heating will not turn on’. Housing providers across the country are now firmly committed to channel shift but for residents to embrace digital channels they need to offer a more attractive alternative to picking up the phone. While headless interfaces like Amazon Echo will work great for some segments of residents the first step for most housing providers will be implementing a text based bot that can deal with common housing queries and deal with repairs. Fuzzlab is one of the first companies working in housing to experiment in this space. Their repairs diagnosis module uses a chat interface to allow residents to report issue and complaints in natural language. This type of bot can diagnose the problem creating a job for the right contractor and offering the resident a range of time slots to suit the residents schedule. This is the beginning of automation in channel shift – it provides convenience, residents can report repairs in any language 24/7 without needing to wait and it can become even more clever.. The really exciting part comes where we begin to teach the bot to understand colloquial language and slang. Using machine learning the bot can validate its understanding through accessing repair records after a job it created is completed. So when a resident reports that their door is ‘opening a bit iffy’ and the bot deploys contractor equipped to deal with doors and locks the contractor job notes will feed back to the bot so it knows that ‘iffy’ means ‘sticky hinge’. In time the bot learns and has greater understanding of context. This helps housing providers get more fixes right first time and make the reporting process reliable and robust for residents. Amazon, Google, Apple and Facebook all have forms of chat interfaces and are looking to expand their ecosystems to take in new contexts and use cases. Device manufacturers are rushing to create integrations and their is an opportunity for housing to look at its own sector specific integrations. 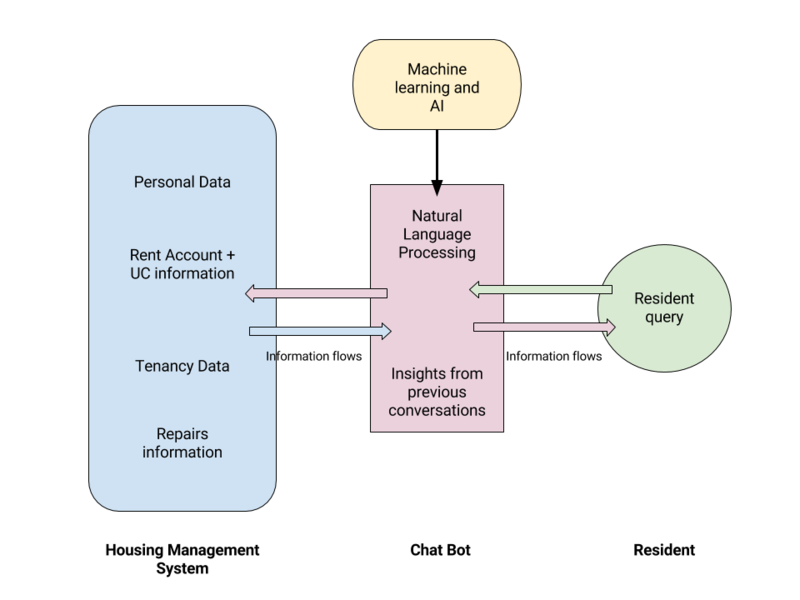 In my last blog on bots I created this diagram to show how a chat bot might interface with housing provider legacy data systems. The essence of this is still correct as housing provider data systems are pretty much in the same place they were last year (compare this to Facebook messenger bots!!). So the question is who will be the first to get an integration with a major headless interface provider or build the first bot that can speak to a housing management system? The sector is now more aware than ever about the benefits of going digital and rapidly learning the value of bots so it feels like now is the time for a developer to step up and build a housing chatbot to really take advantage of the promise of digital channel shift, automation and AI.